The elbow is the joint between the upper arm and forearm. Many different symptoms can involve the elbow, like elbow pain and stiffness. Sometimes lumps may form in and around the elbow. These lumps are often due to the same causes as elbow pain and elbow stiffness. Lumps may form from the bones in the elbow joint or soft tissue like the joint lining, muscles, tendons and skin. There are three bones that make up the elbow joint. The ends of the long bone of the upper arm (humerus) and the two thinner bones of the forearm (radius and ulna) form the elbow joint. Like most other limb joints, the elbow joint has a synovial lining. This lining produces a lubricant known as synovial fluid which reduces friction in the joint. A thicker capsule surrounds the joint and it is supported by ligaments, tendons and muscles. Noting the nature and size of the lump, when it arose, what events may have preceded the onset of the lump and other features can help with a diagnosis. There are many different possible causes of elbow lumps. As mentioned, these lumps may not be a problem with the joint itself but with other structures around the elbow. For example, an enlarged lymph node near the elbow joint can occur with infections and other conditions. This lymph node may be located in and around the elbow region but can become inflamed due to problems in the hand or fingers without any elbow problem being present. It is often difficult to diagnose the exact cause of these lumps in the elbow without diagnostic investigations like x-rays or CT scans. Although most of the common causes of elbow lumps are not serious, it is nevertheless important to have the lump assessed by a medical professional. In rare cases, elbow lumps may be associated with serious diseases like cancer. Arthritis of the elbow is a common condition. Arthritis means inflammation of the joint tissue, like the joint lining. There are several different types of arthritis. Swelling occurs with inflammation and this may be described as a lump. Sometimes nodules may form, as is seen with rheumatoid arthritis. Osteoarthritis (OA) occurs with wear and tear of the joint and tends to affect older people. Rheumatoid arthritis (RA) is an autoimmune condition resulting in joint inflammation. Gouty arthritis is joint inflammation caused by uric acid crystals in the joint space. Post-traumatic arthritis is joint inflammation that arises after injury to the elbow. Septic arthritis is a less common type of arthritis and occurs due to infection of the elbow joint. Overuse and stress injuries are common and may affect the joint as well as surrounding structures. Tendinitis is inflammation of the muscle tendons. Some of the tendons of the upper arm passes across the front and back of the elbow and may be felt as lumps in the elbow region. Bursitis is inflammation of the small fluid-filled sacs near joints. These sacs known as bursae (singular ~ bursa) help to reduce friction between tendons, muscles and bone. However, it can become inflamed with trauma or overuse. It is also commonly affected by repetitive stress injuries. Apart from post-traumatic arthritis, injury to the elbow can also cause lumps for other reasons. Dislocation or fractures are consequences of severe and forceful injury. 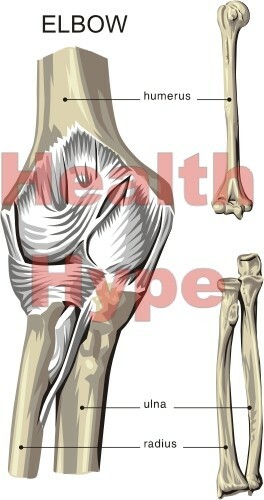 Apart from the swelling due to inflammation, the bone may cause a hard lump in the elbow region. Sometimes a healed fracture may lead to an abnormal bony protrusion. Pieces of bone or cartilage may break off and become lodged within the joint space. This affects movement at the elbow joint and may also be palpable. A foreign body may also enter into the elbow joint or around it which may be retained and be felt as a lump. As discussed, inflammation of the elbow joint is known as septic arthritis. The microbes, usually bacteria, may gain entry with a break in the skin. This can occur with an injury, particularly sharp force injury. Certain medical procedures involving the area may also result in an infection. Cellulitis of the hand is not uncommon. This is where the tissue under the skin becomes infected and it rapidly spreads. The elbow joint may then be affected. An abscess can also occur in or around the elbow joint which may be seen and felt as a lump. Abscess is a collection of pus which is often associated with an infection. Tumors can occur in and around the elbow joint although this is rare. These tumors may be benign (non-cancerous) or malignant (cancerous). Cysts are fluid-filled sacs that can occur for various reasons. These sacs are abnormal and should not be confused with bursae. Sometimes these sacs may be filled with air or other substances. Overall these growths are uncommon in the elbow joint but must be considered as a possible cause when a elbow lump is detected.